And your comments just made the connection for me that my Golden Honey shares my Scottish heritage (I'm a Douglas). I never thought of it that way before. Regal, indeed! 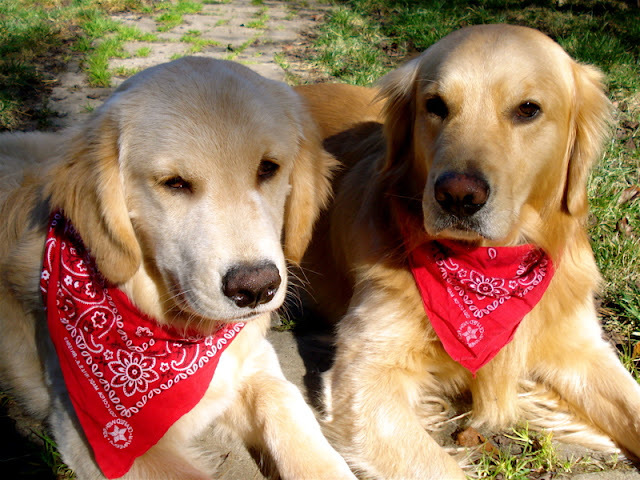 Love the red bandanas! I think they look great! I put Opie in a black bandana yesterday. He looked tough! And he didn't chew it off. It also muffled the sound of his many, many tags. I agree! Very regal. That is a great picture. Red's his color. So adorable! Great pics as always. I'm wondering if it's just a dog thing. My dogs don't like to sit next to large objects either. Just wanted to hop by! I love stopping by to look at your fabulous pictures! Very daper! Excellent photos. 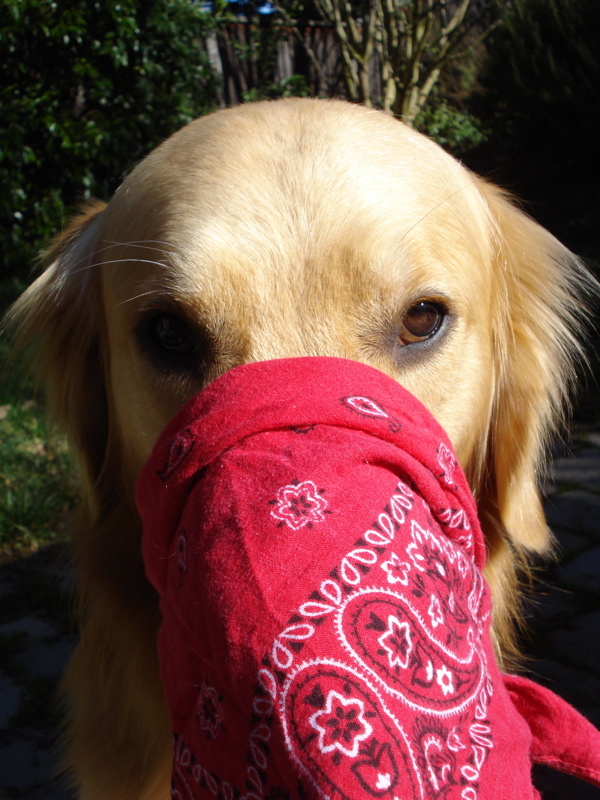 I could probably get my dogs to sit next to something, but I couldn't do the bandana over the nose!! Cute bandana photos! I like the one you chose for the Daily Shoot too. 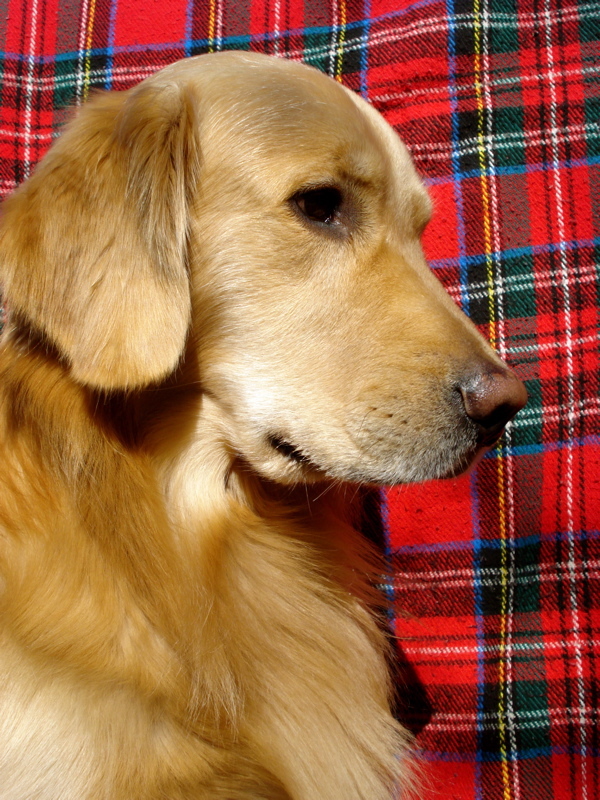 Love the plaid background! What a beautiful profile! P.S. Thanks for the photo compliment. We're trying to learn more and more about our camera. Your gorgeous blog photos inspire us to keep snapping away! I love the plaid, but I don't think your boys ever take a bad picture! I like the golden bandit!! for Halloween you can dress them in the traditional feather bonnet, doublet, kilt and don't forget the spats! BOL! Sorry, but my Humans are both of Scottish ancestry.